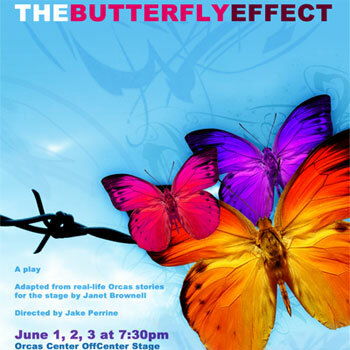 Orcas Center is presenting The Butterfly Effect, a play inspired by a worldwide movement of anti-bullying video messages and adapted from local stories by Janet Brownell and directed by Jake Perrine. “This production is a direct response to the epidemic of gay teen suicides across the country,” says director Jake Perrine. “It is a message of hope from our gay island elders to our youth that “it does get better” after the awkward trials of high school. If the faith of even one person seeing it is restored, or one person reconsiders bullying someone else for being different, we will have succeeded in our aspirations. I think anyone who feels “different” could benefit from a vote of confidence at that age. As well, once we understand that those who are “different” among us are people, too – three-dimensional people with hopes, fears, and dreams like anyone else – perhaps we can begin to accept difference and empathize with it, rather than judge and punish it. At the end of the day, we are all ‘different’.” Cost: $15 ($2 off for Orcas Center members), students FREE. This entry was posted on June 1, 2012 by Lance Evans in Activity, Eastsound, Event, Events, Theater, Uncategorized and tagged orcas center, orcas island, theater.